Blue sharks are highly migratory species and occupy the apex predator level in the food chain. They are the most widely distributed shark species and the most abundant. Blue sharks have life history characteristics that make them vulnerable to fishing pressure. In the south Pacific, the stock status of blue sharks is unknown as no assessments have been conducted. In the north and east Pacific, the population is healthy and is not being overfished. The status in the Indian Ocean is unknown due to a lack of data. The blue shark population in the WCPO is thought to be healthy although there is much uncertainty in the data and there is evidence to suggest that catch sizes and rates have been declining recently. In the North Atlantic, blue shark populations are thought to be healthy whereas the status of the South Atlantic population is unknown. The population of blue sharks in the Canadian Atlantic Ocean has been assessed as healthy. Blue sharks are managed by the Inter-American Tropical Tuna Commission (IATTC) in the eastern Pacific Ocean. Some shark finning measures are in place, but there are no other regulatory measures such as catch limits. Although an assessment of the blue shark population was conducted in the north Pacific Ocean recently, there continue to be concerns over missing data for blue sharks. Management of the blue shark population in the Indian Ocean is the responsibility of the Indian Ocean Tuna Commission (IOTC). No management measures are in place for blue sharks nor their byatch. In the WCPO, blue sharks are managed by the Western and Central Pacific Fisheries Commission (WCPFC). There are no management measures for blue sharks in the WCPO. Although there are some management measures for sea birds and sea turtles in the WCPO, effectiveness is unknown. The International Commission for the Conservation of Atlantic Tunas (ICCAT) manages blue sharks in the Atlantic Ocean. There are no management measures for blue sharks in the Northern or Southern Atlantic Ocean. In Canada, blue sharks are managed by the Department of Fisheries and Oceans Canada (DFO) and ICCAT. Blue sharks are caught as bycatch in the targeted tuna and swordfish fisheries. Although Canada has a National Plan of Action for sharks, there is no catch limit for blue sharks caught as bycatch. Pelagic longlines are a nonspecific fishing method. Extensive bycatch of tunas, sharks, sea turtles and seabirds occurs. The non-target species caught include several of near-threatened or endangered status as designated by the International Union for Conservation of Nature (IUCN). The species of concern include loggerhead, hawksbill and leatherback turtles, as well as shortfin mako sharks and albatross seabirds. The blue shark fisheries put significant pressure on these threatened species. Management is insufficient to protect the bycatch species. Pelagic longlines have minimal impacts on the habitat as they rarely make contact with the seafloor. The ecosystem impacts of removing exceptional species through fishing has not been explored, and is not incorporated into management schemes. Silky sharks are highly migratory species and occupy the apex predator level in the food chain. Silky sharks have life history characteristics that make them vulnerable to fishing pressure. The status of silky sharks in the eastern Pacific Ocean is currently being assessed and there is much uncertainty around their status. The status of silky sharks in the Indian Ocean is unknown due to a lack of stock assessments and data. The unknown status is of concern because sharks are species that are vulnerable to overfishing. In the Pacific Ocean, silky sharks are managed by the Inter-American Tropical Tuna Commission (IATTC) and the Western and Central Pacific Fisheries Commission (WCPFC) . Some measures protect silky sharks such as prohibitions around shark finning, but there are no catch limits or other measures in place. The Indian Ocean Tuna Commission (IOTC) manages species caught in the longline fishery. However there are no management measures for silky sharks and no stock assessments performed. Pelagic longlines and FAD purse seines are nonspecific fishing methods. Bycatch of threatened species occurs. Of particular concern in the longline fisheries is the bycatch of the white-chinned petrel, leatherback turtle, loggerhead turtle, and several species of albatross where fishing pressure causes significant impacts to these highly vulnerable populations. FAD purse seines cause the bycatch of sharks, primarily oceanic whitetip, boy fish, and other tuna. Management is insufficient to protect the bycatch species. Pelagic longlines have minimal impacts on the habitat as they rarely make contact with the seafloor. FAD purse seines typically do not make contact with the seafloor unless the FAD is anchored to the bottom. The ecosystem impacts of removing exceptional species through fishing has not been explored, and is not incorporated into management schemes. Shortfin mako sharks are highly migratory species and occupy the apex predator level in the food chain. Landings of shortfin mako sharks have historically been low, and in 2013, 35 mt were landed in Canada. In the US, 402 mt were caught in 2013. In the south Atlantic, catches have been variable and peaked in 2003 at 3,426 mt. In 2013, catches in the south Atlantic were 1,907 mt. The Indian Ocean longline fisheries landed 3,573 mt in 2013. The data on catches of shortfin mako sharks in the Western Central Pacific Ocean (WCPO) is very uncertain and likely underreported at 3,700mt in 2013. Shortfin mako sharks have life history characteristics that make them vulnerable to fishing pressure. In the North Atlantic, the shortfin mako shark population has been assessed as being healthy, although there is uncertainty around these results. In the South Atlantic, the population is healthy. The status of shortfin mako sharks in the Indian Ocean is unknown due to a lack of stock assessments and data. The unknown status is of concern because sharks are species that are vulnerable to overfishing. The status of shortfin mako sharks in the Pacific Ocean is unknown. Shortfin mako sharks are caught as bycatch in the targeted tuna and swordfish fisheries of Canada and the US Atlantic. In Canada, shortfin mako sharks are managed by the Department of Fisheries and Oceans Canada (DFO). In the US, they are managed by the National Marine Fisheries Service. The International Commission for the Conservation of Atlantic Tunas (ICCAT) also oversees management in the Atlantic. Canada has a National Plan of Action for sharks, but shortfin makos are not included in this management scheme. There is a lack of catch limits or quotas for shortfin mako sharks in the US management plan as well as in the South Atlantic. The Indian Ocean Tuna Commission (IOTC) manages species caught in the longline fishery. However there are no management measures for shortfin mako sharks. In the Pacific Ocean, shortfin mako are managed by the Western and Central Pacific Fisheries Commission (WCPFC). No management measures are in place for shortfin mako sharks in the North Pacific, South Pacific, of Western Central Pacific Oceans. Porbeagle sharks are highly migratory species and occupy the apex predator level in the food chain. Landings of porbeagle sharks peaked in 1994 at 1,575 tonnes and decreased to 19 tonnes by 2013. 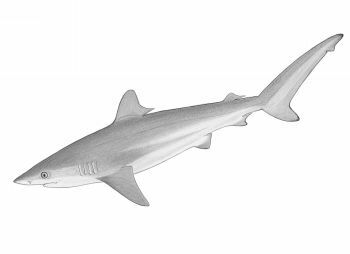 Porbeagle sharks have life history characteristics that make them vulnerable to fishing pressure. Porbeagle shark populations have not been assessed recently but it is thought that the they are currently below sustainable levels. Porbeagle sharks are also listed as endangered by the Committee on the Status of Endangered Wildlife (COSEWIC). In Canada, porbeagle sharks are managed by the Department of Fisheries and Oceans Canada (DFO) and the International Commission for the Conservation of Atlantic Tunas (ICCAT). Porbeagle sharks are caught as bycatch in the targeted tuna and swordfish fisheries. The directed fishery for porbeagle sharks was closed in 2013 and porbeagle sharks are included in Canada’s National Plan of Action for sharks. Pelagic longlines are a nonspecific fishing method. Bycatch of threatened species such as bigeye tuna, Atlantic Bluefin tuna, leatherback turtles and loggerhead turtles occurs. Management is insufficient to protect the bycatch species. Pelagic longlines have minimal impacts on the habitat as they rarely make contact with the seafloor. The ecosystem impacts of removing exceptional species through fishing has not been explored, and is not incorporated into management schemes. Most shark species worldwide have been severely overfished. Over a 100 million sharks are captured and killed each year. Many are caught for their fins, with the rest of the animal discarded as bycatch. In many countries this has been banned but shark-fin soup continues to appear on the menu in many parts of the world despite dramatic declines in shark populations. Sharks grow slowly, mature late and have low reproductive output. These characteristics make them inherently vulnerable to fishing pressure. Sharks have been severely overfished in many part of the world. Even if populations were given the opportunity to rebuild, recovery would be very slow. Management plans do not exist for most species of Shark. Where there are management plans, they often group many species into one category which makes it difficult to determine the status of any particular species. Shark fining is banned in many countries but sharks continue to be caught for their fins on the high seas where regulations are even less prevalent and enforcement is sparse. Sharks are caught as bycatch in bottom trawls, pelagic longlines and bottom longlines. Gillnets and longlines that specifically target sharks also cause the entanglement of sea turtles, seabirds and marine mammals, some of which are protected or endangered. Sharks are caught in many different fisheries using a variety of different fishing gears. Nets, longlines and gillnets cause less damage to seabed habitats than bottom trawls.